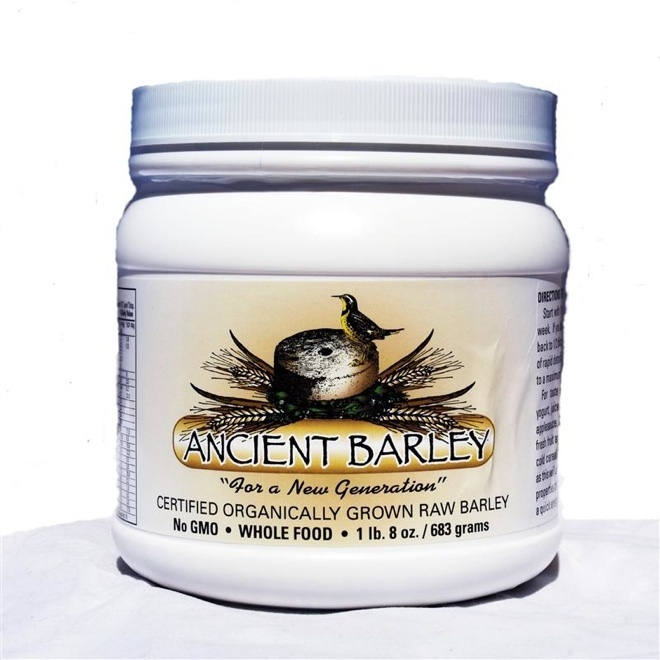 Barley-Ancient Barley Gold Superfood is Living Raw Barley ~ Helps body HEAL + DETOXIFY! Ancient Barley is organic Raw Barley Superfood Living Sprouted Barley helps the process of Detoxification so our bodies can heal. decrease cancer risk when Ancient Barley is eaten as a part of a healthy diet. Start with 1 Tablespoon per day for the first week. If you develop any discomfort, cut back to 1/2 Tbs., as this is usually a result of rapid detoxification. Gradually work up to a maximum of 2 Tablespoons per day. You can be creative and add this powerful nutrition to your cereal, smoothie, juice, etc. This container has 107 level Tablespoons. SPECIAL DEAL 2 for $80.00!! What makes Barley so beneficial is that it is naturally rich in the B-complex vitamins, minerals such as potassium + calcium. Barley is rich in beta-glucan soluble fiber which is especially beneficial for Diabetics. Barley is also very high in the antioxidants: tocols. Barley is well-known in the Middle East as medicine for the heart. The Edmonton Journal, October 27, 1999. Leave Barley Gold to go to Home page.